While you read this, an unmanned Wave Glider surface vehicle is riding swells alone in the Gulf of Mexico, collecting critically needed post-Hurricane Harvey water quality data. Thanks to a Texas A&M University partnership with Liquid Robotics, the Wave Glider’s manufacturer, researchers will use the glider’s real-time data to examine how Harvey’s record-breaking rainfall now flowing into the Gulf will affect water quality, coral reefs and ecosystems. Researchers call the approximately 11-trillion-gallons of freshwater flowing out of river deltas and into the Gulf the “freshwater plume.” Unfortunately, it’s potentially headed towards the fragile coral reefs in the Flower Garden Banks National Marine Sanctuary, 100-miles off the Texas Coast. As of Sept. 14, Texas A&M Geochemical and Environmental Research Group (GERG) researchers reported the plume had spread about 30 miles from the coast. The freshwater plume’s potential effects could be severe — dangerously low salinity, harmful algal blooms and low oxygen levels could all result and cause major harm to the corals, as well as saltwater habitats, fish and other organisms throughout the affected Gulf area. Named the Gulf Explorer by the research team, the Wave Glider SV3 was deployed Sept. 8 from the RV Manta, a research ship operated by the Flower Garden Banks National Marine Sanctuary, which is funded by NOAA. GERG, part of the College of Geosciences at Texas A&M, launched the Wave Glider from the Manta in partnership with Liquid Robotics. The RV Manta also carried its captain and crew, a field engineer from Liquid Robotics and 17 faculty, staff, graduate students and undergraduate students from GERG and the College of Geosciences. The Texas A&M Chancellor’s Research Initiative also had a hand in making this research possible; the Wave Glider was initially purchased by GERG with funding from the initiative. After Hurricane Harvey devastated the Texas coast, it became clear to GERG and Liquid Robotics that using an autonomous surface vehicle would be an efficient way to gather and report important real-time ocean data and understand the new impacts to the ecosystem. “We are honored to assist Texas A&M on this historic mission to help oceanographers understand how parts of the Gulf of Mexico ecosystem are impacted by Hurricane Harvey,” added Mark Bindon, Vice President Mission Services at Liquid Robotics. "It’s a great example of how Wave Gliders are augmenting traditional oceanographic tools to help scientists gain real time insights to the changing conditions of the Gulf and its tributaries." 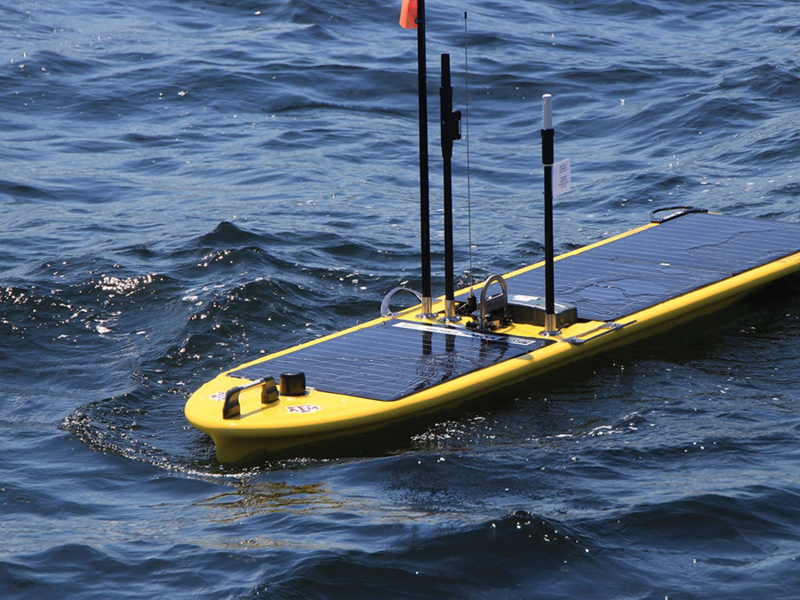 The researchers deployed the Gulf Explorer Wave Glider about 25 nautical miles from Galveston, where freshwater intrusion into the Gulf was evident. “We were tracking extremely low salinity values, very uncharacteristic for this time of year,” DiMarco said. “All of the freshwater that resulted from Hurricane Harvey is coming out of Galveston Bay, out of the Brazos, Trinity and Sabine rivers, and all of that flows out into the Gulf, then impacting the coastal environment,” he added. Because such major in-flows are not typical in these parts of the Gulf from those watersheds, he said “this much freshwater flowing out there could impact the coastal environment tremendously,” potentially causing low-oxygen conditions and harmful algal blooms. For the next 60 days, the Gulf Explorer Wave Glider will be piloted by GERG and Liquid Robotics personnel as it collects ocean data in a daily path around the northern Gulf, taking salinity and temperature measurements every 5 minutes, and reporting those to the shore station every 30 minutes. The research team is very concerned about the freshwater plume’s potential negative impacts to the Flower Garden Banks. “This could put the Flower Garden Banks in jeopardy,” he said. View this photo album for more images from the Wave Glider's deployment. The Gulf Explorer Wave Glider SV3 in the Gulf of Mexico.